It is quite a common fact that as much women are in love to stay stylish with latest fashion trends, in the same way, men has the equal rights as well. There are so many magazines for men that are being all around the world through which they do get some idea about the latest fashion trends and style statements. International magazines have another concept as the men of Pakistan would love to catch with the magazines of Pakistan. As you would be looking around the fashion marketplaces you would be finding with so many magazines for men that are popular enough in Pakistani society. Now you would be thinking in mind that which are the top most famous magazines for men in Pakistan? Well, by scrolling down into this post you would be checking out the list of top 10 magazines for men that are high in popularity in Pakistan. In this way, you would be getting the chance to learn which magazines you should issue and which to not! On the 10th spot, we will be adding the name of Style 360 Glam magazine. This magazine is all about the fashion glamour and fashion world. This magazine is getting into greater demands on the men because of growing number of viewers. This magazine makes you learn about the Pakistani fashion and clothing trends. On the next, we will add up with the name of the online fashion magazine for men named as Style360.pk. This fashion magazine will be able to make the men learn about the latest fashion style trends and new fashion concepts. This magazine is serving its visitors with the online access through which they can check the latest editions of the magazine free of cost. Filmfare magazine was started from Indian fashion planet and now it has made itself to be the major part of the Pakistan fashion globe as well. By the way of this magazine, the men would be able to get inside the entertainment world and even grab the details of the fashion arena too. On the 7th spot of the magazines for men in Pakistan, we do have the name of Hello magazine! It is famously known as the international fashion magazine that is now available in Pakistan. This magazine started to be published since 2012. Through the way of this magazine, you will be able to get the complete update with Pakistani fashion and clothing trends. On the next, we have the name of Sunday magazine! It is one of the top leading magazines for men in the Pakistan. This magazine is covering all the aspects ranging from the health, fitness, fashion world and even the entertainment world. This magazine has surrounded itself with the millions of readers in just the least time period of the career start. Next on our list at 5th spot of famous magazines for men in Pakistan we have Good Times! It is another one of the top famous international magazines that have not made its well-known place in Pakistan fashion world too. This magazine is all included with the health, fitness and latest trends of fashion articles. On the next, we have Ink magazine! This magazine is meant for both men and women. It is an international based magazine that is covering half of the portion of the Pakistan fashion world. This magazine has been started off just a few years back and now in just the short time span it has made itself to be one of the top leading magazines for men. Ebuzz magazine stands on the 3rd spot on our list! This magazine is featuring with the complete details related to the men latest fashion trends, fitness and health. This magazine is accessible on top of the weekly and monthly basis editions. On the 2nd we have High Profile Magazine! Just as the name of the magazine the concept of the magazine is high profile as well. This magazine is included with the latest fashion trend articles all along with the health and fitness articles for both men and women. On the last and yet at the top we have Paperazzi magazine for men! This magazine for men is identified on the international level with the basics of fashion trends related to the men, celebrity features and much more. 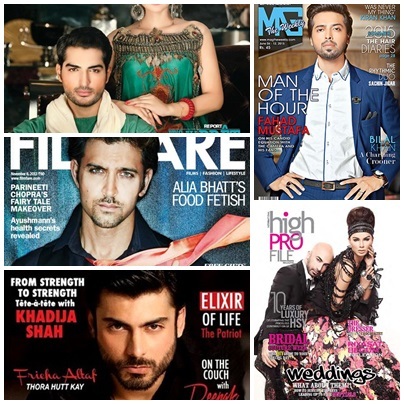 So these have been the top famous and best magazines for men in Pakistan! All these magazines have made their special place among the readers that has made them appear to be stand-out within the market world. If you have still not read out any one of these magazines then just without wasting any time issue up their latest editions right now!